The federal Highway Trust Fund is broke. What’s not broke in Washington? Think about how our world has changed since the interstate highways were built in America. Living in Cincinnati, if I want to drive up to Chicago for the day and back – no problem. Cleveland? 4 hours away. I’ve driven to Atlanta and back on the same day. The interstate system in the U.S. really is an incredible engineering feat. The interstate’s upkeep is supported by an 18.4 cent per gallon federal gas tax (24.4 cent per gallon on diesel). Candidly, that’s a bargain considering the convenience the highways provide travelers and businesses that deliver goods to every corner of this country via 18-wheelers. All good things do come to an end, however. In less than four years, in 2018, the Highway Trust Fund will be broke to the tune of $63 billion. That’s what they’re telling you now. The truth is it’s already broke. Since 2008, $41 billion has been transferred to this fund from general revenues to keep it solvent. A few things are causing this. First, the federal gas tax has not be raised since 1993, so it hasn’t been adjusted for inflation. Second, people are using less gas because it’s more expensive and cars are more fuel efficient. That hurts tax revenues. Third (and most importantly), when an endless stream of tax dollars are created in Washington, politicos can’t keep from spending it on other things. In 2007, Secretary of Transportation Mary Peters admitted just 60% of fund revenues are used for highway and bridge construction. 40% is used for earmarks. “Pork.” Pet projects in local districts like Cincinnati’s doomed streetcar, costing hundreds of millions for a four mile loop of rail few will ride. 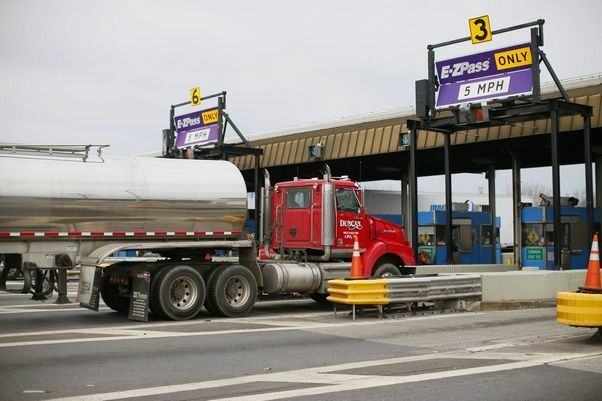 The Obama administration is proposing the elimination of decades old restrictions that prohibit charging tolls on approximately 46,000 miles of interstate roads, allowing individual states to collect tolls on federal highways to pay for repairs, snowplowing and new construction. I know you’re saying. There are already toll roads, what gives? Roads such as the Ohio and Indiana Turnpikes and the New York State Thruway were built without money from the federal government and built by the states. After the toll road success of the first portion of the Pennsylvania Turnpike, which opened in 1947, Washington thought toll road turnpikes could be built and those roads then incorporated into the federal interstate system. The feds in turn used money that would have been used to construct those 2900 miles of turnpikes to build the remainder of the interstate highway system. Tolls on the interstate highways are just a new tax needed because of Washington’s continuing fiscal mismanagement of the American checkbook. The promise in 1956 was all proceeds from the federal gasoline and diesel tax would be used to build and maintain the interstate highway system. When that money tree start growing dollar bills, those green backs were picked and used for other things like city sidewalks, bike paths, scenic trails and urban transportation, which translates to “streetcar” in Cincinnati speak. Sure there are groups favoring this tax. Construction workers and their unions, construction companies and even the states, because states would begin collecting a new and never ending tax revenue stream. One more thing. Buried deep in the pages and paragraphs of this proposal is doubling spending for urban transportation. $22 billion annually to build street cars for cities like Cincinnati. The malfeasance never ends and you pay. This will be debated in Congress in September and probably passed in the dead of the night. ← Background on V. Stiviano. She Changed Her Name Too. When America was great you didn’t need more than these.